The compound - Organo-Osmium FY26 - attacks the weakest part of cancer cells. Researchers have witnessed - for the first time - cancer cells being targeted and destroyed from the inside, by an organo-metal compound discovered by the University of Warwick. Professor Peter J. Sadler, and his group in the Department of Chemistry, have demonstrated that Organo-Osmium FY26 – which was first discovered at Warwick – kills cancer cells by locating and attacking their weakest part. This is the first time that an Osmium-based compound – which is fifty times more active than the current cancer drug cisplatin - has been seen to target the disease. Using the European Synchrotron Radiation Facility (ESRF), researchers analysed the effects of Organo-Osmium FY26 in ovarian cancer cells – detecting emissions of X-ray fluorescent light to track the activity of the compound inside the cells. Looking at sections of cancer cells under nano-focus, it was possible to see an unprecedented level of minute detail. Organelles like mitochondria, which are the ‘powerhouses’ of cells and generate their energy, were detectable. FY26 was found to have positioned itself in the mitochondria - attacking and destroying the vital functions of cancer cells from within, at their weakest point. 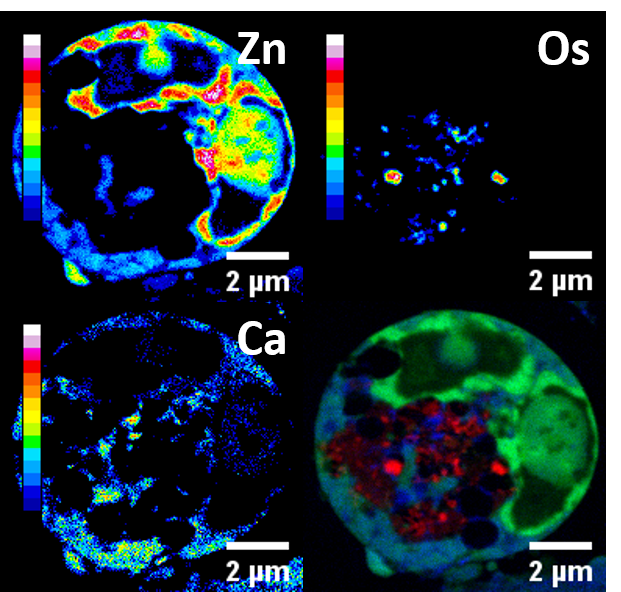 Researchers were also able to see natural metals which are produced by the body – such as zinc and calcium – moving around the cells. Calcium in particular is known to affect the function of cells, and it is thought that this naturally-produced metal helps FY26 to achieve an optimal position for attacking cancer. FY26 has been shown to be more selective between normal cells and cancer cells than cisplatin – having a greater effect on cancer cells than on healthy ones. “Cancer drugs with new mechanisms of actions which can combat resistance and have fewer side-effects are urgently needed. Professor Sadler’s group, including research fellows Dr Carlos Sanchez and Dr Isolda Romero Canelon, gained their results with Dr Peter Cloetens and colleagues at the ESRF in Grenoble, France – a powerful synchrotron source which emits extremely powerful X-ray beams. "These kinds of experiments are normally performed using bigger doses than what would be done in real life or on a coarse scale that does not provide a clear picture of the processes that take place. On the new nano-imaging ID16A beamline, however, by combining a very tight focus and high flux, we could get a real picture of where the drug goes in a single cell using real-life pharmacological doses." The research, ‘Synchrotron X-Ray Fluorescence Nanoprobe Reveals Target Sites for Organo-Osmium Complex in Human Ovarian Cancer Cells’, is published in Chemistry - A European Journal. It is funded by grants from Cancer Research UK & Engineering and Physical Sciences Research Council, The Wellcome Trust, and the European Research Council.